Trim, rinse, and thoroughly dry the green beans. Put them in a medium bowl and toss with buttermilk to coat. Combine flour, cornmeal, baking powder, salt, and cayenne in a large bowl or re-sealable plastic bag. 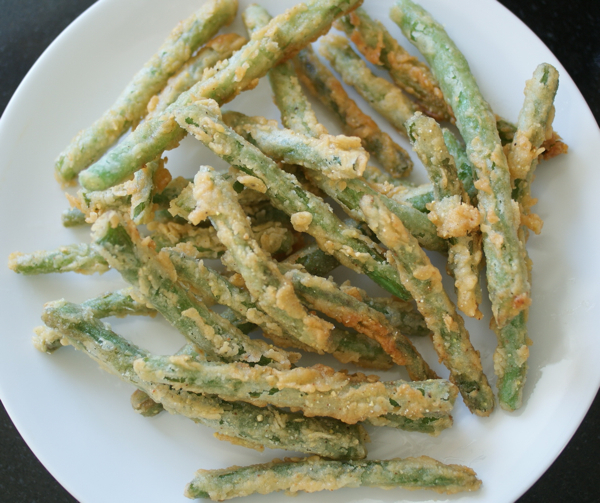 Drain green beans and toss them in the flour mixture to coat thoroughly. Bring about 1/2 inch oil in a wide, heavy pot to 350°-375°F over high heat. Adjust heat to maintain that temperature range. Test temperature using a thermometer or by dipping the handle of a wooden spoon into the oil. If the oil bubbles around the handle, it is hot enough to fry the beans. Shake excess flour mixture off beans as you add enough of them to form a single layer in the oil. Fry until golden to medium brown and beans are tender, about 3 minutes. Transfer with tongs or a slotted spoon to a cooling rack set over paper towels. Sprinkle with salt and serve hot. Repeat with remaining beans. TIP: Make sure your oil is quite hot so the beans don't get saturated. You should know that the flour mixture is enough to coat 2 pounds of beans, maybe more.